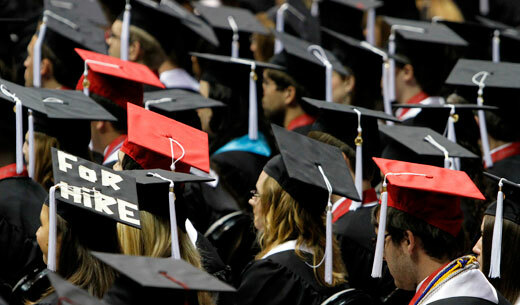 Republican senators today filibustered the Stop Student Loan Interest Rate Hike Act. Their action threatens to create havoc with the economy, and wreck the country’s future. Student loans are not some kind of “entitlement,” as Republicans have suggested. The loans become heavy debts. Students carry on average $25,250 in debt while facing the highest unemployment rate in recent history at 9.1 percent, according to projectstudentdebt.org. Two-thirds of college seniors graduated with loans in 2010. Incredibly, student loan debt is estimated at $1 trillion, surpassing credit card and auto-loan debt! If the rates are allowed to double, as projected, students will pay on average $1,000 more in interest on government-guaranteed Stafford loans. That’s $1,000 less for more productive spending than paying interest, spending that helps to create jobs. This bill the Republicans filibustered today was needed, because the cuts in student loan rates are due to end July 1. These rate cuts were passed under none other than President George W. Bush! How extreme the Republicans have become just in the last four years, that they are now unable to back decent legislation supported by the former GOP president. Recent college graduates face unemployment rates over 9 percent and the underemployment rate is 19.1 percent with rates for African American and Hispanic graduates much higher. Instead of unleashing the potential in these young people to solve problems and stimulate the economy, there is a growing legion of young indentured debt servants to the banks. College students face the choice between an unpaid internship or, if they wanted to get paid, a position at McDonald’s, according to a recent New York Times article. It was the lack of jobs, mounting debt, and the unpaid internship vs. low-wage job dilemmas that led to the Occupy Wall Street movement. That movement’s demand has been to write off existing student debt, as well as free public higher education. As many student movements and organizations have said: Education is a right, not a privilege! While passage of the Stop Student Loan Interest Rate Hike Act was important, and Senate Republicans are blocking it, much more than just that act itself is needed. The long-term and realistic way to deal with debt would be to support the Occupy-inspired reforms. There are other reasonable approaches, like the one being pushed by students in California. They are calling for a law that would make four years of state university free for all full-time, in-state students who maintain a 2.7 GPA or do seventy hours of community service a year. Tuition money lost as a result would be paid for with a small increase in taxes for those earning more than $250,000 per year. This fight over student loan interest rates is part of a bigger tea party-Republican war on American values, and designed to divide the country, vilify the president, and win the White House and Congress for Republicans in November. Let all Republican lawmakers be warned: They continue their attack on students and young workers at their own electoral peril.